In a study that even Sum 41 could get behind, scientists at the University of Illinois in Chicago are tripping senior citizens over, and over, and over again—all to save lives. The researchers are hoping their experiment—which involves a series of computerized, moving treadmills—could end up developing a preventative sort of balance training, stopping falls before they happen. Or as Clive Pai, a physical therapy professor and lead researcher on the study, calls it, "a vaccine against falls." 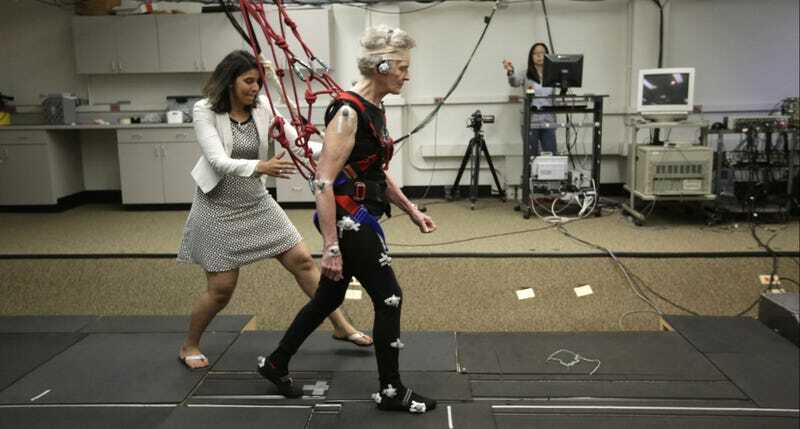 In the study, volunteers (such as the badass 81-year-old Mary Kaye, seen in the photos) are hooked up to sensors that track their movements. They're also hooked up to an overhead harness, which is used as last resort to keep them upright. Then, once on the walkway, volunteers will encounter sudden—and seemingly random—moving sections, all of which are actually controlled by the scientists via computer. Subjects then move on to a treadmill—the pace of which will be interrupted with sporadic jolts of speed. In the case of Mary Kaye, she managed to keep her balance every time, which researchers attribute to her training on the moving walkway. Standard fall prevention techniques aim to improve physical condition by strengthening certain muscles and improving range of motion. And they may require dozens of sessions to be effective, Pai said. His research is focusing on building subconscious learning, and evidence so far shows it can happen surprisingly fast. "This is all implicit learning. We don't give any instruction. They don't have to be motivated — they're naturally motivated because they don't want to be on the floor," he said. The study's preliminary research, published in June, reported that 24 "trips," or stumbles due to the moving walkway, trained the subjects to catch themselves should they lose their balance at some point in their daily lives, reducing overall chances of falling by a total of 50 percent.